Note that this is exactly the same as the “makes 6” recipe, but doubled, since I often have enough people over that I’ll make a double batch, and didn’t want to have to do the math every time. These popovers are so incredibly light, crispy and awesome that you’ll want to blow off the rest of the day just to linger over breakfast, fresh coffee and a newspaper. They go beautifully with a mushroom, onion and shredded cheddar-jack cheese omelet. or make a nice home for a perfectly poached egg with a slice of cheddar. This is a very simple recipe, but it’s important to make sure everything is the right temperature, or they won’t puff up. Popovers puff up from internal steam pressure. If the ingredients are cold, the outside will harden before the inside puffs up. Enjoy! Each one is a unique work of art. 2 2/3 C All-purpose flour, sifted (measure after sifting). 2 2/3 T All-purpose flour optional – if you want more “insides”. Move oven rack to the lowest position put popover pan in oven and preheat to 475°F. Heat the milk in the microwave until warm but not hot. Put the eggs in a bowl of warm water. Once the milk and eggs are warm, beat the eggs with a whisk and add in the warm milk while whisking. Add all the dry ingredients while whisking. Make sure to whisk out all the lumps. 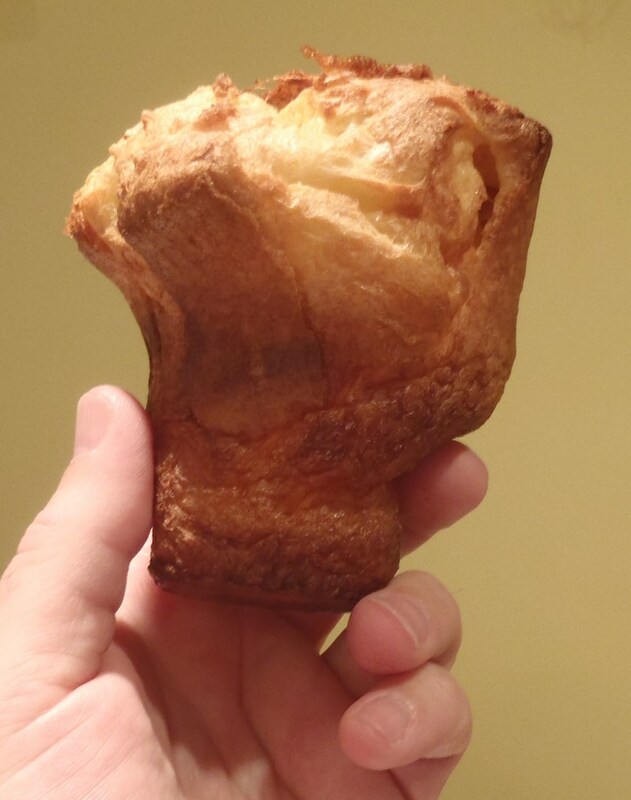 Remove the pan from the oven, quickly fill each popover cup 2/3 full and put back in oven. Bake until crusty and light brown, about 20 minutes. Reduce oven temperature to 300°F and bake another 10 minutes to firm up the insides. Serve hot, with butter and honey. 5 Weight Watcher’s Smart Points each.